Far, far away from Paris Halle Berry sported some Swiss sportswear on the beaches of Miami over the holiday weekend. Berry looked to be hanging with friends, unaware that the French Open was going on and that she missed the Sony Ericsson Open by a good two months. Berry was wearing a HI-PRO cap, a Swiss company owned by our good friend Ivo Heuberger. The folks at HI-PRO also outfit the Swiss Davis Cup team, just in case you were wondering. More Halle: Lots of pictures up on Just Jared. The Nike ad for the upcoming World Cup is getting plenty of buzz around the net. But there have been few mentions of Roger Federer‘s cameo in the 3-plus minute shot. Fed battles in ping pong against England’s Wayne Rooney, who is apparently (in the ad) on a red-hot streak (Just Roo It!). No Rafa appearance?! Even Kobe takes part in the action. See the clip by clicking the image above. 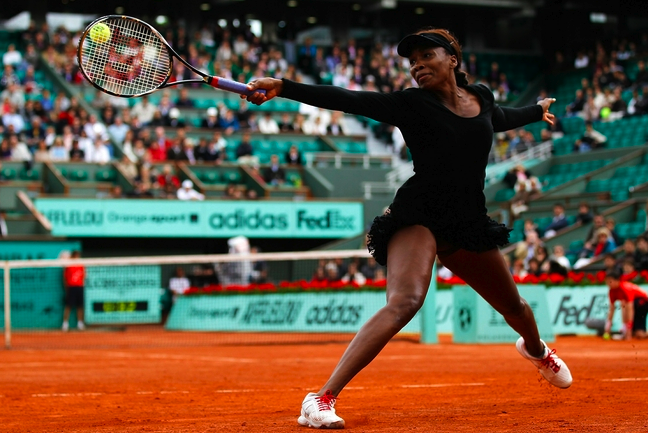 We’re halfway done with the 2010 edition of the French Open and both the men’s and women’s draws are shaking out to ready for an entertaining week two. We took a collection of our biggest surprises from Week One and wanted you all to let us know what you thought was the shock of the tourney thus far. Well, day five of the French Open is already underway and you’ve got to be thankful for a little Grand Slam reprieve in your life! I know I am! It really is a blast to have all those scores coming in and matches to pay attention to. Victoria Azarenka and Dinara Safina didn’t pay too much attention to their respective matches, and they were the only big (big) names to crash out in the first round of the tournament. Andy Roddick, Andy Murray and Jo-Wilfried Tsonga all survived five-set encounters to move on to round two. 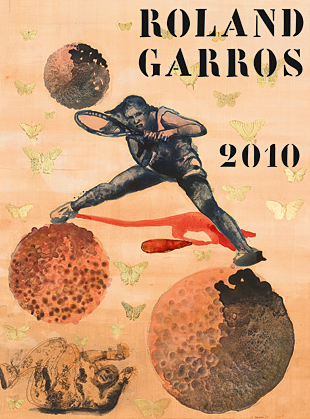 If you were wondering about the Roland Garros poster, the New York Times Straight Sets blog has the nitty gritty from Pakistani-born Indian artist Nalini Malani, who designed it this year. I’ve gotta say it’s something I always look forward to – seeing what sort of art the French will include for their home slam. And if you’ve done a little digging on the Roland Garros web site, you’re probably a fan of My Little Roland Garros, under the Event Guide. Plenty of fun (TSF-inspired?!) stuff happening in there. Laura Robson might be skipping out on the French this year (smart choice, we think), but the British gal isn’t skipping out on the opportunity to make good of her recent rise to stardom. She has partnered with Right to Play, a non-profit that encourages youth to take up sports as a way to community building and improved confidence. Robson is doing plenty with the project, including wearing the RTP wristband at Wimbledon and asking her fans to design what style she will wear during this year’s U.S. Open. New York City is hosting the second annual Kicking and Screening film festival June 1-5 in honor of all things soccer on the screen. Good timing with the World Cup kicking off on June 6. We love to see such collaboration between art and sport, and the festival is just that: over five days ten films will be shown including an already-sold out day five. To add to the visual appeal, the organizers have booked a freestyle juggling group called FreestyleSoccer to wow the crowds on June 3. We don’t do too much in-depth, let’s-talk-about-the-tennis coverage here on TSF, but every once in awhile it’s a healthy practice just us TSFers to dive into and we’re pretty sure you get a kick out of us trying to sound like we know what we’re talking about. I’ve had high hopes for many a players on the WTA Tour, especially those with such salacious backgrounds. You know who I’m talking about: the Jelena Dokic‘s and Melanie Oudin‘s of the world. To me, there is nothing better than a mid-ranked player making a run for her country at her home Slam with the crowd (and the world) cheering her on. It’s something unique about women’s tennis that you can’t quite find elsewhere, and though it rarely happens, when it does it is purely magical. Last year, two such runs captured the attention of tennis fans as Dokic and Oudin made respective runs to the quarterfinals at their home Slams. The back stories were mostly inspiring and the chance for us to ride with them on their incredible journey felt refreshing and new in a women’s tennis tour that can often feel like another tattered episode of Beverly Hills 90210. 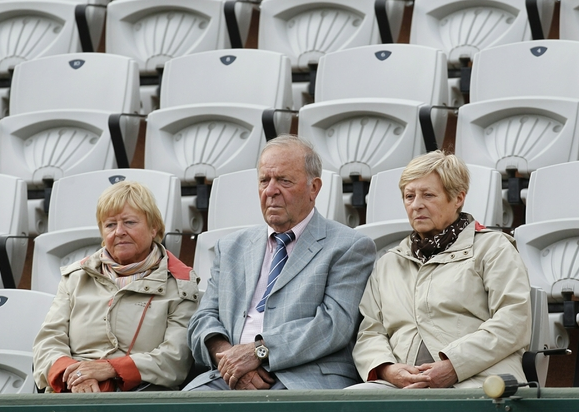 At the French Open, it has been a while since such a run has been made. A decade ago, Mary Pierce finally capped off a tumultuous Roland Garros record by winning the title over Conchita Martinez, and she surprisingly made a run to the finals in 2005, taking out Lindsay Davenport along the way before being humbled by one Justine Henin in the title match. So this year, as Aravane Rezai makes her march through the women’s draw, she cannot do so as a dark horse. Her win two weeks ago in Madrid was a dazzling display of Pierce-like Big Babe tennis, where she hit through the likes of Henin, Jelena Jankovic and Venus Williams. The thing about Rezai seems to be that she really can hit through her opponents with little regard (unlike Oudin) but also has her head squarely screwed on after five years on tour (unlike Dokic). Her history is that of a Dokic-Pierce storybook, chalk full of stories of an over-involved father and threats of playing for a different country (Iran) and spats with the French Tennis Federation. Perhaps such histories have plagued girls on the WTA in the past, but if Rezai continues to play with the resolve she showed Sunday in a 6-1, 6-1 drubbing of Canada’s Heidi El Tabakh, then the French could get their first home-grown story line in quite a while. Amelie Mauresmo could never quite enjoy her experience at Roland Garros because of her distaste for the pressure of the French. But to watch the powerful strokes of Rezai is something special. Few players are not physically intimidated by the Williams sisters, but Rezai can go toe-to-toe with them in a baseline brawl, and if she doesn’t suffer from the Frozen Foot Syndrome that plastered Pierce’s feet to the clay in the 2005 final against Henin, she has a legit shot at being a threat for this tournament. A reward next Saturday for Rezai? First she has to get past Angelique Kerber, a player who drubbed her at this year’s Aussie Open. 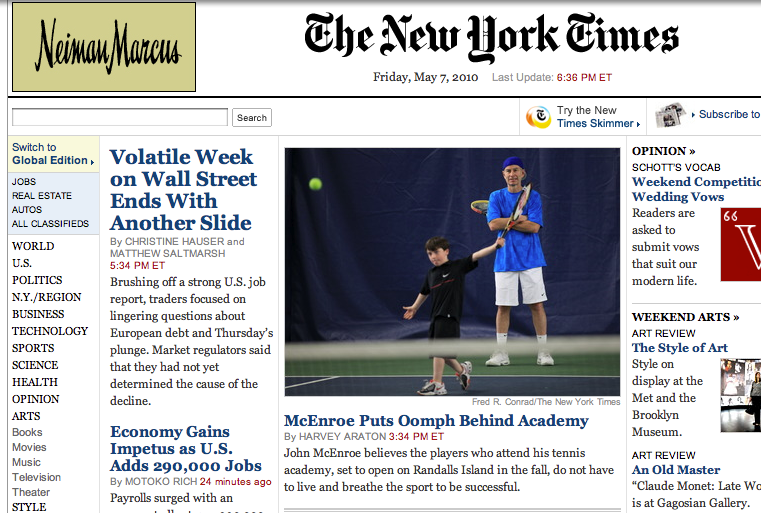 When I used to blog over at Tennis Chatter, Troy did incredible work for me in the Photoshop department. Well, I’m glad I’ve corralled him to be a part of what we do at TSF, because he’s plain brilliant. 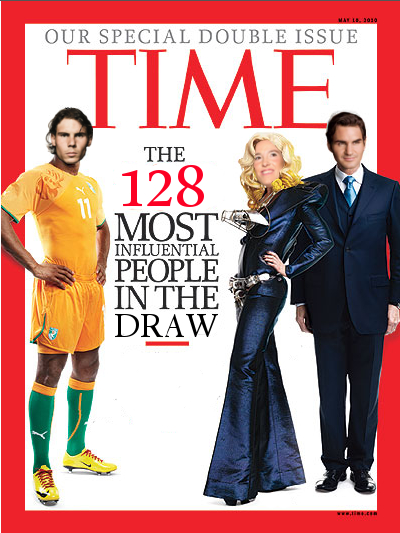 This TIME cover features a soccer-playing Rafa, a dapper Roger and the one and only Lady JuJu. She might be able to hold court with Justine Spears, a good friend from our Chatter days. Well the 2010 edition of Roland Garros has already begun and there’s a few upsets to speak of (Victoria Azarenka, Maria Jose Martinez Sanchez!) on the opening Sunday. I’m surprised that Svetlana Kuznetsova worked her way past Sorana Cirstea so easily (3 and 1) and both Robin Soderling and Aravane Rezai have opened their Paris campaigns in convincing fashion. So before the draws take too much shape, post your picks for the men’s and women’s champion at this year’s second Slam. It’s going to be a wonderful one, right? I can’t wait! 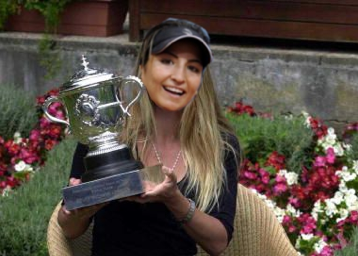 We wonder if Aravane Rezai could become this decade’s Mary Pierce at the French Open? It’s been a decade since Pierce, the on-again, off-again French citizen (according to tennis enthusiasts), won the title at Roland Garros much to her fans’ pleasure. Rezai has already allowed controversy to swirl around her young career, and her Iranian heritage runs parallel to Mary’s history with Canada. Both are bigger-built girls who belt off the baseline and use their hard, flat strokes to make up for less-than-best movement. It will be interesting to see if this really could develop. Rezai has been steadily rising in the WTA ranks for the last three years, and might use 2010 as her breakthrough year after winning in Madrid last week. In what has mostly been a lackluster year, Rezai beat Justine Henin, Jelena Jankovic and Venus Williams to win the tournament. Rezai is a respectable 9-6 at Roland Garros, and this year is a guaranteed seed now that she is in the top 20. Could she be a week two contender? Guess we’ll see which Mary… we mean Aravane, shows up. Looks like the USTA will have plenty of choices when it comes to this year’s Fed Cup final between the U.S. squad and the Italian team. 11 cities have entered bids to hold the November tie. Among the bidders are three cities in Texas (San Antonio, Dallas and Fort Worth) and two in California (Pacific Palisades and San Diego). Looks like Montgomery, Ala. decided to sit this one out (surprise!). Our guess: one of the Texas sites. No WTA event is held within a solid 1,000 miles of said state. 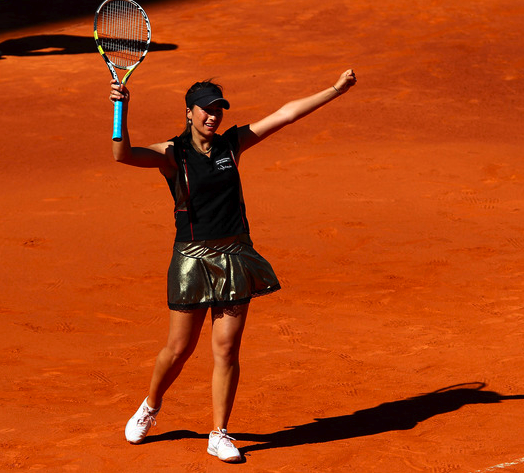 We understand that isn’t winning fashion that Aravane Rezai is sporting in Madrid, but that doesn’t seem to matter much. Girl took home gold over Venus in straight sets and could be a dark horse at the French Open starting in a week’s time. It got us thinking: Who has had the best clay-court season in preparation for the big ball in Paris? —Maria Kirilenko takes out French defending champ Svetlana Kuznetsova, sending Kuzzie’s clay court record this season to almost equal that of fellow ’09 champ Roger Federer in the “Dismal” category. —Ana Ivanovic marches to the semifinals with wins over Victoria Azarenka and Elena Dementieva. —Jelena Jankovic creams Venus Williams, losing just one game in their quarterfinal encounter. —JJ prevails over Serena in a dramatic three-set win, giving her back-to-back wins over the Williams sisters. —Maria Jose Sanchez Martinez beats Caroline Wozniacki, Ivanovic and Jankovic to take the Italian title as an unseeded player. Which was your Rome-ment? Was one most surprising to you? Did you take pleasure in Ana’s run? Could you believe Sveta exited early again? What do you make of JJ’s wins over the Williams sisters? Is she a threat for the French? Are the Williams sisters a threat themselves? Let us know in the comment section. 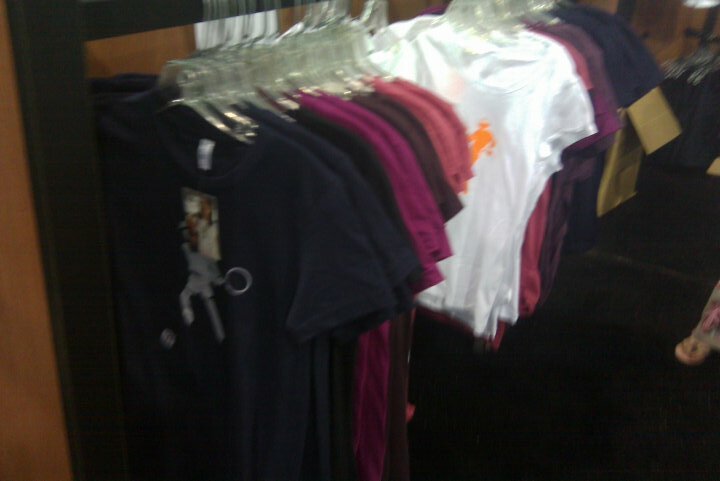 Over the past few years, TSF has closely followed the path of Stick It Wear? !, a California-based sports apparel company run by designer Joe Durica. And for good reason: SIW has continuously churned out trendy tennis-inspired tees that feature a myriad of former and current tennis stars in classy illustrated stick form, including our all-time fave, El Toro. Recently, Durica has expanded his coverage to the lower regions, revealing the aptly-named Eroddick women’s underwear line. The bottoms come in black or white and can be donned with a pink or gray Nadal, Agassi, Safin or Ivanovic illustration for just $16.99 a pair. “Orders are non stop on this,” Durica said of the Eroddick, whose shop at Indian Wells is shown above. But butts aren’t the only thing SIW is covering these days. In addition to the new Eroddicks and already-established t-shirts, a new line of zip-up sweatshirts called Rivalries. The Rivalries line centerpieces great rivalries (Borg/Mac, Sampras/Agassi, Roger/Rafa) with two stick characters divided by the zipper itself. A true fashion battleground. In my hometown of Helena, Mont., they hold a parade each spring known as the Vigilante Day Parade. The event commemorates Helena’s history as a mining community, and high school students get together in groups or 8 or 10 to put together historical floats. From remembering mining expeditions to drive-in restaurants to classic sports teams, it’s always a fun affair on the downtown walking mall. I was happy to see there were a couple of tennis floats this year. 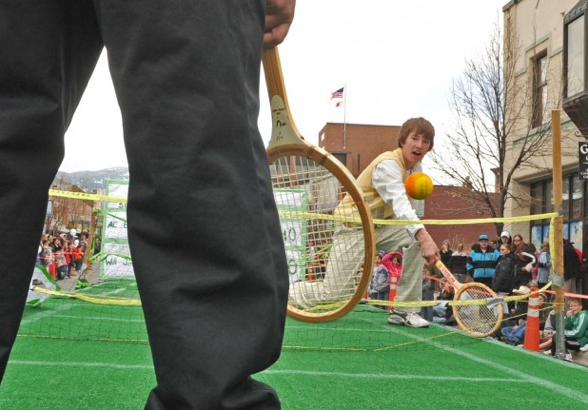 Even Montanans can get their tennis on. And how about that old-time fashion? Speaking of fashion, I took in Adult Ed‘s program, “Success Stories” last night with a few friends, including fellow blogger Rich, of Down the Line! fame. Andrew Feldman‘s talk on tennis fashion was superb. He gave shout outs to the likes of Bill Tilden, Serena Williams and Bethanie Mattek-Sands. The mixed crowd of Brooklyn hipsters was thoroughly impressed (and somewhat shocked?) by all the chatting about tennis fashion. Yes, us geeks are out there, everyone. They’ll get used to us eventually. Sport itself got a great fashion nod this month as World Cup competitors took to the cover (and insides!) of Vanity Fair. Meanwhile, Seattle’s weekly paper, The Stranger, ran a great feature on the fashionistas (and designers and handy people and on and on) that make the Seattle art world tick. An injured Kim Clijsters got her fashion on last week, as well, debuting her Fila summer clothes and even showing some undershort in the process. Mama is bold! There’s plenty going on in the human-interest side of things this week. Sports Illustrated‘s Gary Smith called recently-out rugby player Gareth Thomas the “bravest man in the world” and the boys of Slate.com‘s podcast backed that statement up. Slate’s crew also talked about the early retirement of Mexican L0rena Ochoa from golf, throwing in some Henin/Clijsters comparisons along the way. Shahar Peer opened up in a New York Times piece about a Holocaust site visit with her grandmother, who is a survivor. It was a feel-good story in tennis that delved a little deeper, something we haven’t seen in the recent past from a injury- (and drama) filled tour. And if you haven’t heard about Electron Boy yet, you need to. Or watch here. Briefly: The Feliciano Lopez drama is now approaching Sania Mirza-like levels. Writer Maria Burns Ortiz takes down Jim Courier (in Wii tennis). 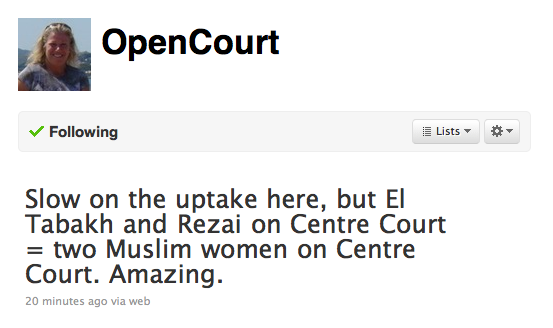 And it’s been a tough go for Robert Dee on the court and in court, too. sunday survey: who’s your favorite? Justine Henin and Rafael Nadal were both victorious at separate big-time clay events today, taking out formidable opponents to garner wins in May. Later this month, both will look to re-vamp their careers with campaigns at the French Open. It got us thinking: who do you think has a better shot at Roland Garros? 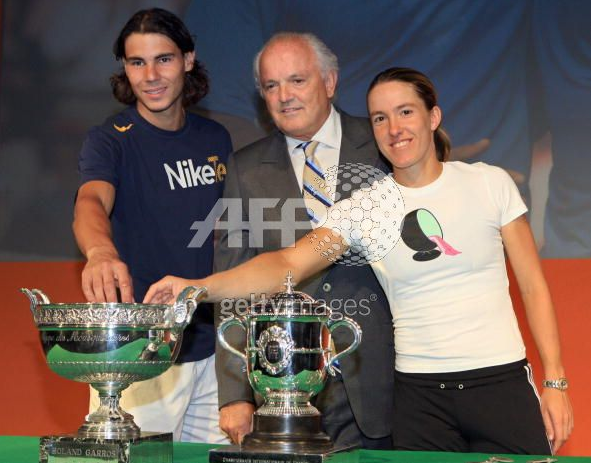 Henin or Nadal? Or, if you think neither of them have much of a chance at all, tell us who you think looks like a good bet to leave Paris with a Slam title.